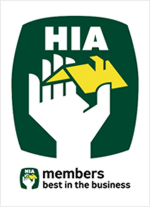 The Housing Industry Association is Australia's largest residential building organization of which Davbuilt Constructions has been an active member for over ten years with Peter Davies serving on the HIA legal committee for a number of years acting in the role of Chairman and Vice Chairman. The HIA is available to provide assistance to both Builders and Owners during construction work and is a great source of technical advice to builders, helping them to adhere to the latest BSA and statutory requirements. We sincerely believe that our membership with the HIA is adds strength to your building with Davbuilt Constructions. Davbuilt Constructions head office is located at Wacol just off the Logan Motorway. This location provides us with a unique opportunity to service the Brookwater / Springfield region. The houses in this area are predominately of a contemporary Architectural design which complements our building specialty. The days of the flat building site appear to be long gone and the Brookwater and Springfield estates are no exception. Our commercial construction experience provides us with the tools to handle difficult, sloping building sites which other builders walk away from. We look forward to continuing our association with the Brookwater / Springfield community. Together with Ann-Maree we work through the design process from concept to Building Approval to ensure that the final project meets your specific personal requirements in aesthetics and functionality of design, environmental elements making the best of the prevailing views, breezes and other elements and or course the most import aspect budget constraints. Having Davbuilt Constructions involved in the design process allows you to feel confident in the buildabilty, functionality and cost control of your design. Davbuilt Constructions' association with Rigid Steel framing commenced in May 2001. Since this time we have exclusively used Rigid Steel Framing to meet the supply of our new home framing needs. We consider ourselves to be steel frame specialist to the domestic market and we can honestly say that we have not found one instance where the use of steel frame construction techniques could not meet the structural performance of a timber frame counterpart. We would be pleased to outline the benefits of utilising a steel frame in your new home should you desire.